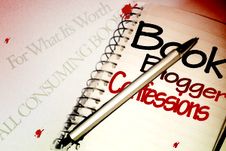 Book Blogger Confessions is a meme that allows book bloggers to discuss issues unique to what we encounter in the blogging world. Every 1st and 3rd Monday of the month we will post a question and invite you to answer, comment and discuss opinions and different views. If you would like to participate in this meme please feel free to grab the button to include in your post with a link to for For What It's Worth Reviews, Tiger's All Consuming Media or below. This week's topic: Making money off your blog. Almost all of us blog as a hobby in our spare time, usually for free but is there anything wrong with making money off your blog? Should bloggers charge for reviews? What about advertising on a blog? When a blogger does allow book related advertising does it turn you off? Make you wonder about the honesty of their reviews? Do you have a problem with purchase links (Amazon for example) that earn a blogger a small commission if a person purchases a book through that link? This past year at the Book Blogger Convention at BEA, an attendee stated that book bloggers should charge for their reviews. I wasn't present at this particular panel, so I don't know exactly what was said, but this concept was foreign to me. It never crossed my mind in a million years that a book blogger should charge for reviews. I thought the whole purpose behind a blog was to express your own thoughts, creativity and to let your personality shine through while doing it. I thought that was the whole innovative concept behind a blog, to give an unbiased opinion and that was why people (sometimes) respected or trusted a blogger's opinion more than say, oh, a company's website. A real person who actually tested a product, stayed at a certain hotel or even read a book may elicit more confidence that that company's website even with testimonials. Even political blogs tend to explain facts and problems in a way that I can understand without a skewed opinion. I still say that anyone and everyone should be able to do what they want on their blog. But I guess I don't understand the concept behind a blog like the one that is in Michele's post. Wouldn't it be considered something other than a book blog? Or, maybe there are just all kinds of book blogs out there and I'm only now just discovering this. Let's say that I charge for reviews...would it be transparent on my blog somewhere? If so, how could I ask readers to trust that I am giving an honest opinion? Wouldn't this fall under more of a publicity site? Also, if I had a book and I was paying someone to review it isn't that what an editor is for? Or even a beta-reader? I understand that some authors just want to get their books out there and they want to promote it, but wouldn't an author want positive reviews on the merits of their story and not just because of a payment? Now what if you are a review site that gets paid for reviews, but they are honest, whether the book is positive or negative. Again, why would an author pay that review site when they may possibly get a negative review? Perhaps for the exposure. Michele's post touched upon an "online presence." Authors can do this via Facebook, Twitter, guest posting and interviews. There just doesn't seem something quite right about paying a review site for a "nice" review. However, to play devil's advocate, maybe the sites/blogs that do this can simply find something good to say about any book they read. I can certainly find something good to say about a book I disliked, even if it is only "Well, it got people reading!" There are some blogs that do that too, but those blogs are clear that they do not give negative reviews and that they enjoy promoting books. I think the difference is they are honest up front. As I said, a blogger can do what it wants on their blog, even be a bit dishonest. But they have to understand that if things come to light, there may be consequences. When I first started blogging I was vaguely aware of other blogs that generate money or get products by testing them out, etc. I really never thought that could be part of a book bloggers world. Then I started hearing about Amazon affiliates, Google ads and saw blogs that had ad space. I really have no problem with book blogs that generate money off their blog for ads, etc. The only thing that bothers me is when the ads get in the way of the blog or are too distracting. I am not really sure that people make all that much money from Amazon affiliates anyway. (I know I don't. In fact I have not made anything - and yes it states that I am an Amazon affiliate on my Policies page.) Personally, I probably would not include ad space on my blog, but that is just my choice. I don't think I could generate that much traffic to do so anyway! Of course, however, I think that sites need to be careful. If you are a blog that touts a certain book and there is a huge paid ad for said book, you may be susceptable to someone being dubious. I'm sorry this was so long winded. I didn't think I had so much to say on the topic! What do you think? Do you agree? Disagree? Please feel free to discuss or make your own post. I am leary of blog reviews that get paid money because I don't know if they are honest. If I did any reviews I always have said so but they were for products not book reviews. I don't have a problem with people running their blogs the way they want too. I don't think it should be an actual problem for other people either. The fact is there is probably a readership out there for everyone. Am I likely to frequent a blog that only posts positive reviews, probably not. Do I trust people who get paid for reviews any less or any more? Nah, I base it on the reviews and whether I think they like the same books as me. I don't care if they get paid or not to do them. The fact is if people want to put in the time, money, and promotion to make money off their blog--I say more power to them. Each individual can decide if they are going to read them. As bloggers I think we sometimes forget that every 1 of us there are 100 more readers on the web that don't have blogs. They may only be searching for positive reviews of books that they want to read or they may just want promotional material. I have no idea. All that being said, I don't know any one personally or on my blog roll that gets paid for their reviews so it probably isn't a type of blog I would follow. @Julie - Yes, I think transparency is the key. @Felicia-I love that you are reiterating that everyone should be able to run their blogs the way they want without judgement from others. I do believe that, but I also belive that if you decide to run your blog in certain ways you are subject to the opinions of the public...if that makes sense. But you are right...there is something out there for everyone. If people want to get paid for reviews, I think it's fine as long as they are VERY transparent about it. I probably won't read them unless they are incredibly entertaining, but... whatever. If you can get paid and keep your readership, well, that's good, but I think it will be tough. Hmm, I probably just wouldn't trust the review as much if it was coming from someone getting paid to write it. I won't begrudge those who make money off their book blogs, but the majority of the blogs I follow will always be those that read and review because they love books- and their opinions will be the ones I think of when it comes time to buy a new book. @Steph-I agree...I think transparency is the key. Just be honest! @Kate-I have to say I probably wouldn't either, but there are so many book blogs out there, a person can still get a feel for whether they'd like a book or not. I agree about blogs being places for creative expression and personal opinion. I go to blogs to hear somebody saying what /they/ think, not spouting the company line about a product, or skewing their opinion in return for payment. I don't agree with blogs that get paid to review. A review is a review and should be honest. Now, blogs that advertise that is okay as long as it does not take over the blog. I hate visiting blogs that has ads everywhere. Besides, it also slows down the page loading so I get tired of waiting, exit out and go to another blog. To me getting paid for reviews is more like marketing, but it's your blog so I guess you can do what you want, I just personally don't agree with it. I will say that if a blogger gets money for reviews and doesn't disclose that info clearly than they should be ashamed of themselves!